Not too long ago, when someone lost a tooth to decay or an accident, they were left with a gaping hole between their other teeth. Eventually, dentistry advanced to the point where an artificial tooth with wires that wrapped around remaining teeth on either side of the missing one helped fill the gap. This was better than leaving a space, but the wires often produced adverse reactions to the other teeth and gums. Finally, dentists figured out a way to replace the root of the missing tooth, giving them something to attach an artificial tooth to. The dental implant was born. The dental implant is not the entire tooth. It is something that is embedded into the gums to replace the original root. 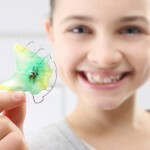 This gives the dentist some way to attach a crown that resembles the missing tooth and have it stay securely in place. The implants are surgically attached to the jawbone below the gum line. While they are not seen from the outside once they are in place, without a substitute for the tooth root, there would be no way to securely attach a crown. Having an artificial root may seem uncomfortable, but the implants become so much a part of the mouth eventually that they do not cause discomfort. Titanium, a light-weight metal, is used to create the dental implants. This is the same metal that is used when other bones in the body need extra help to hold them together. Titanium is very compatible with human biology and the body does not reject it as it would certain materials. In fact, once titanium is introduced as a tooth root or part of another bone, the natural bone of the human body eventually bonds with it, making the implant even more secure. It takes close to six months before the bone and titanium fuse enough to create a strong base for the artificial teeth. Implants come in two forms, called Endosteal and Subperiosteal. The first on consists of a titatium “root” being surgically implanted directly in the bone. Once the area heals, a post is attached to the initial root and then a crown is attached to the post. In subperiosteal implants, a frame made of titanium is placed in the mouth, below the gums. The frame has a post already attached to it that can be seen above the gums. The new tooth is then attached to the post. 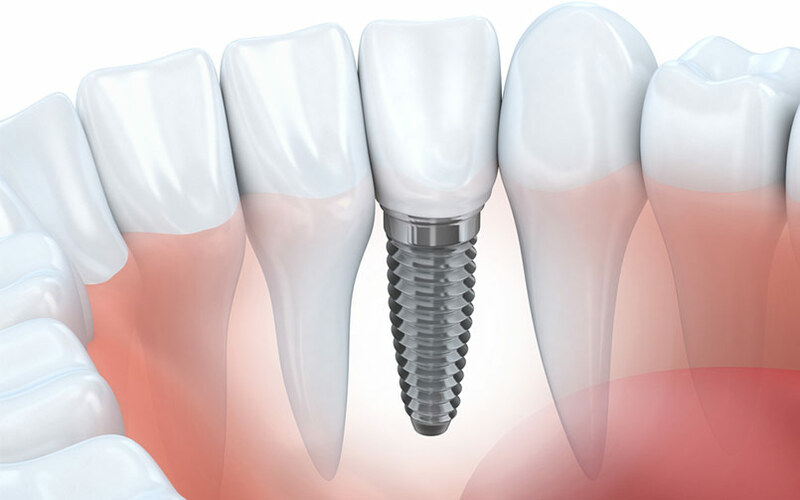 Besides providing a stable place for a replacement tooth to rest, there are other benefits to implants. *They enable a person to retain their normal smile. *Facial bones do not deteriorate as they do when some bones are missing. *Remaining teeth do not become crooked as they shift to fill in missing bone in the jaw. *Implants are safe and lasting, making them a more permanent solution than other methods of tooth replacement. *They can be utilized for single tooth, multiple tooth or even entire denture replacement. While most people who have lost a tooth are candidates for dental implants, there are some factors a dentist will consider before making the final decision. First, a person needs to be in good health, including having healthy gums. If your gums are not healthy, bacteria can cause issues with the replacement. A person with cancer or diabetes may have problems with the bone fusing to the titanium and people who smoke or drink excessively may find the healing process less than adequate. A dentist will take a full medical history before making the final decision. If the person is found to be an acceptable candidate, a dental surgeon will be scheduled to perform the implant and new teeth will be created to help return the person’s smile to its original brilliance.